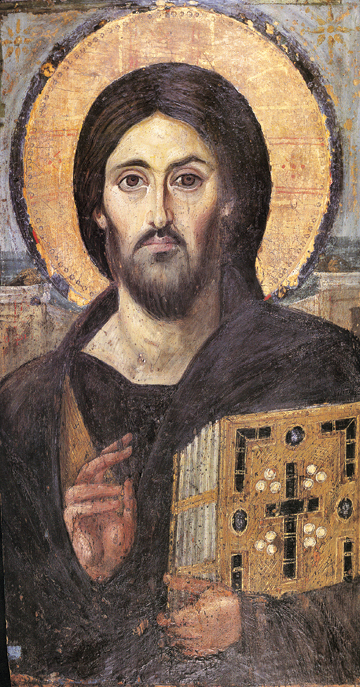 “Pantocrator” is the Greek word meaning “Ruler of All”, and many icons of Christ are modeled after this original. Christ is traditionally shown with a short beard and long dark brown hair parted in the middle. Often in the earliest icons there can be some naturalistic elements such as visible shadow and regular skin tones even though the medium of icons always is somewhat abstract, trying to show in artistic forms the revelation of all things as they will appear at the end of chronological time. 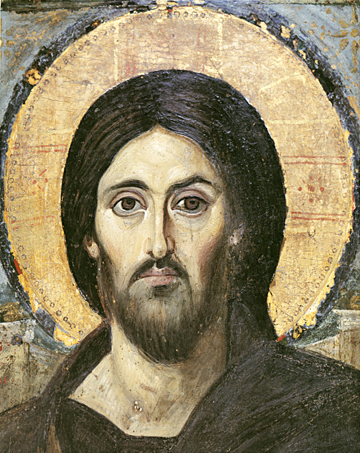 In this icon Christ’s nose, eyes, and neck are not merely naturalistic. The Saviour has a serious and intent look, like the King of All looking upon His people. This detailed view of Christ’s face shows a dignity on one side and a different arching of the eyebrows causing enlivenment on the other. The different impressions strike a harmony between His divine and human natures. Worked in an encaustic or a wax-melting technique, this great treasure from the sixth century is one of the earliest icons of Christ still in existence. It is preserved at St. Catherine’s Monastery at the foot of Mount Sinai by the climate and lack of iconoclast persecution in that area.